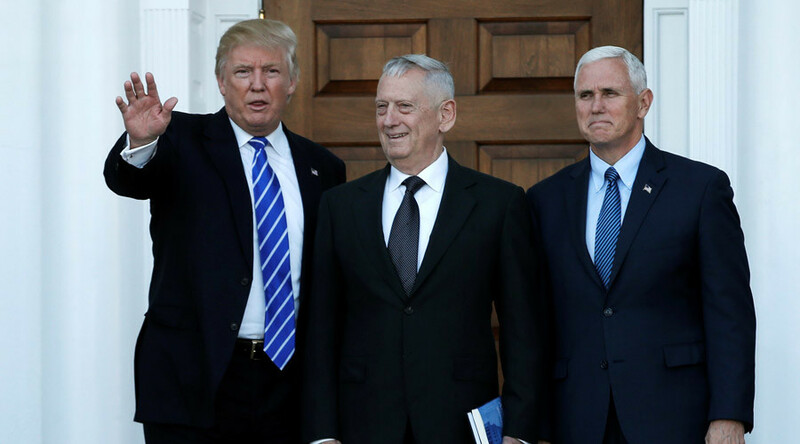 President Trump, in his first significant official act as president, signed legislation Friday allowing retired Gen. James Mattis to run the Pentagon as defense secretary. A Senate vote to confirm Mattis, 66, is scheduled for later in the day. But Trump first needed to sign the bill passed by Congress granting him a waiver to serve, given the law on the books that bars former service members who’ve been out of uniform for less than seven years from holding the top Pentagon job. Sitting in the Senate reception area less than an hour after assuming office, Trump signed the measure granting Mattis a a one-time exception. Congress last allowed an exception to the law in 1950 for George Marshall, a former five-star Army general. Trump also signed nomination papers for Cabinet choices and a presidential proclamation declaring a national day of patriotism, according to a tweet from White House Press Secretary Sean Spicer. Congressional leaders attended the signing ceremony, including Senate Majority Leader Mitch McConnell and House Minority Leader Nancy Pelosi. After the ceremony, Trump gave McConnell the pen he used to sign the papers nominating his wife, Elaine Chao, to head the Transportation Department. Although Senate Democrats agreed to a vote on Mattis, they are blocking efforts to confirm Mike Pompeo to head the Central Intelligence Agency (CIA). Shortly after Trump became president, the Department of Housing and Urban Development also suspended the Obama administration’s planned reduction of mortgage insurance premium rates, a move that had been intended to make home ownership more affordable. Gen. James Mattis was confirmed as Secretary of Defense in a Friday evening vote. Mattis was approved by a vote of 98-1. Sen. Kirsten Gillibrand, D-N.Y., was the lone vote against. Donald Trump called out Islamic terrorism in his blistering Inaugural speech after he was sworn in today saying, “We will eradicate it completely from the face of the earth”. General Mattis is a great addition because he is not politically correct when it comes to talking about the dangers of Islam. You can watch a powerful speech that Mattis gave about Islam at The Heritage Foundation here.